God Help The Outcasts is a very different Disney heroine song. 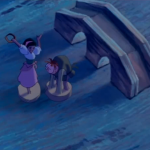 Many of the Female Disney Characters sing about wanting something for themselves. 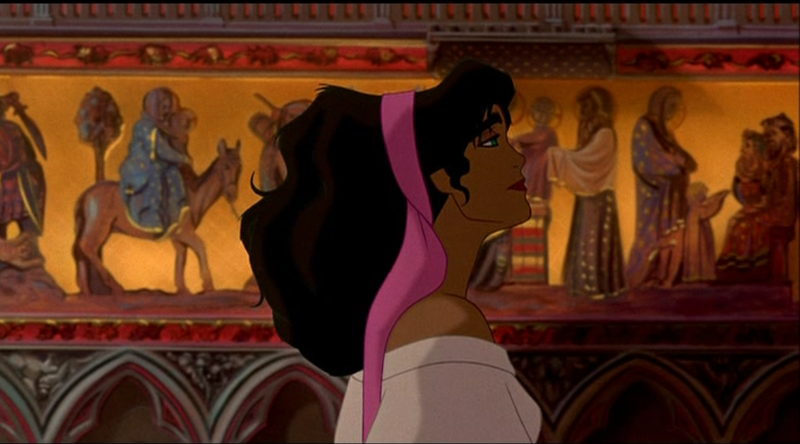 While Esmeralda is singing about wanting something that is not for her. She is being selfless which furthers elevates her into the mature sector. 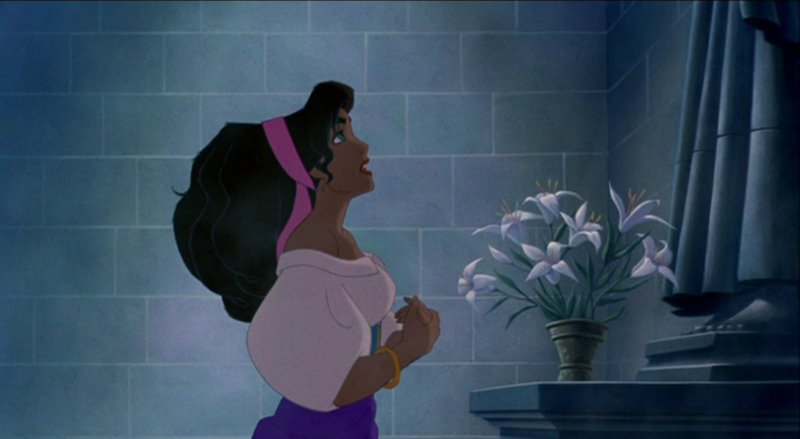 The song is simple, it’s Esmeralda praying for the welfare of her people. This humble and selfless prayer is shown in contrast to the other parishioners who pray for selfish things like wealth, fame and love. This scene is pretty much lifted from the 1939 version albeit with some differences but the overall scene and content is the same. 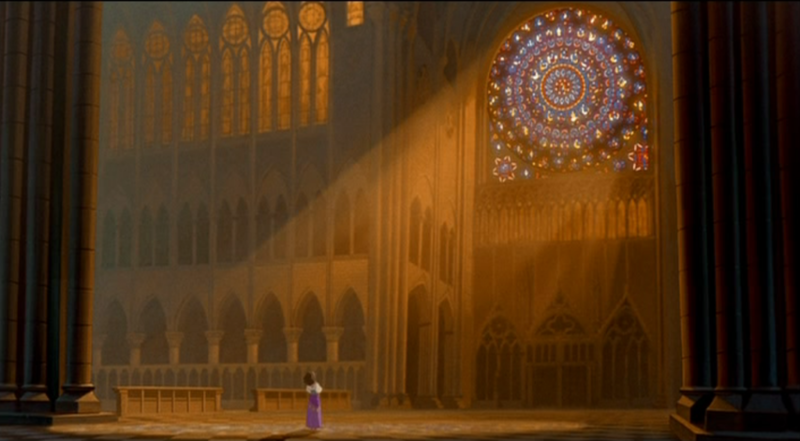 Unlike in the 1939 version, during the course of the song Esmeralda walks through the sanctuary of Notre Dame. It’s the only time in the Hunchback of Notre Dame where we get to see the interior of Notre Dame other than the bell tower. While it’s nice to see the sanctuary portion of Notre Dame there are more than a few things wrong with how Notre Dame is presented. I’ll go more in depth on that later for now let’s get into the reviewing the song’s content. The song musically is nice and is pleasant. It’s one of two ballads that made it into the film. It’s the prettiest song in the movie and it’s sung well by Heidi Mollenhauer. However there is an air of condescension with this song. As Esmeralda is trying to sound humble she is saying some really condescending lines. She asks for nothing because she is lucky and better off then most of her people and if God doesn’t help no one will help them. She also reminds Gods that everyone is “children of God” and that Mary should relate to her because she thinks Mary was once an outcast like her. This another fault with the song, she’s in Notre Dame de Paris, in any Notre Dame, Mary is the figure of reverence. However she starts praying to Mary and then instantly switchs to God. Maybe it’s her “outcast” “pagan” ways that she would do this flippantly but my guess is God is more dramatic and fits song meters better, Even though Mary embodies compassion. 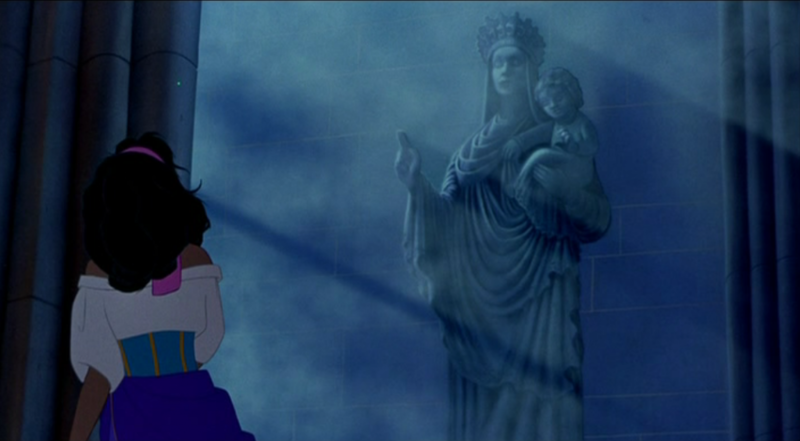 Then again Frollo prays to Mary to burn Esmeralda, so what is the movie trying to say about Mary? I mean everyone seems to be trying to get out of Notre Dame. There is also all her “I” statements that are kind of off putting. Her lines are “I ask for nothing, I can get by, but I know so many less lucky than I” these lyrics just seem to reek with “I’m better than you” mentality. 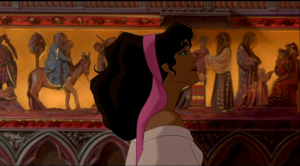 In the spectrum of the “Esmeralda’s Prayer” which isn’t in the book, God Help the Outcast is the worst. Beside this song there are two other prayers, the fore-mention 1939 version and Ave Maria Paien from Notre Dame de Paris. 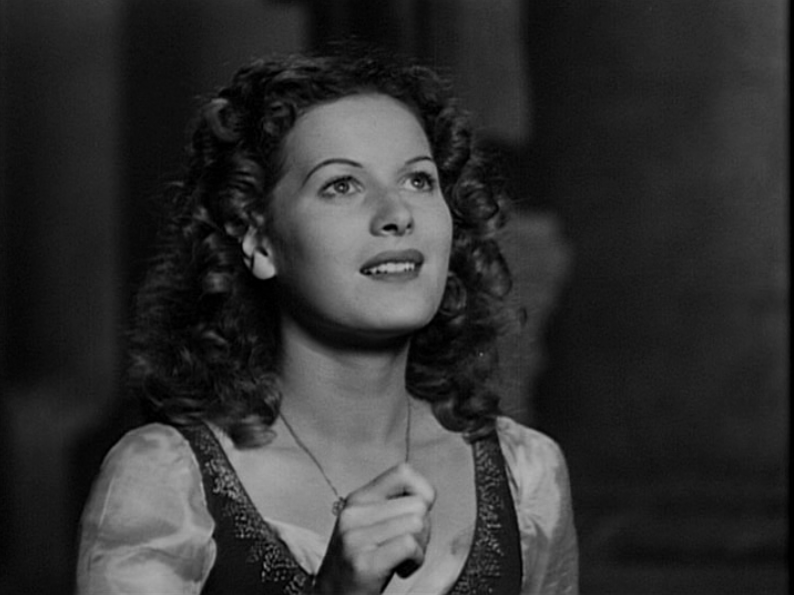 In the 1939 version, Esmeralda (Maureen O’Hara) asks “The mother of God” to help her people, she says that Mary can take all that she has but Esmeralda presents Mary with a Method; she asks to speak to the King as he is a authority figure and can help her and her people, which he does as the end. 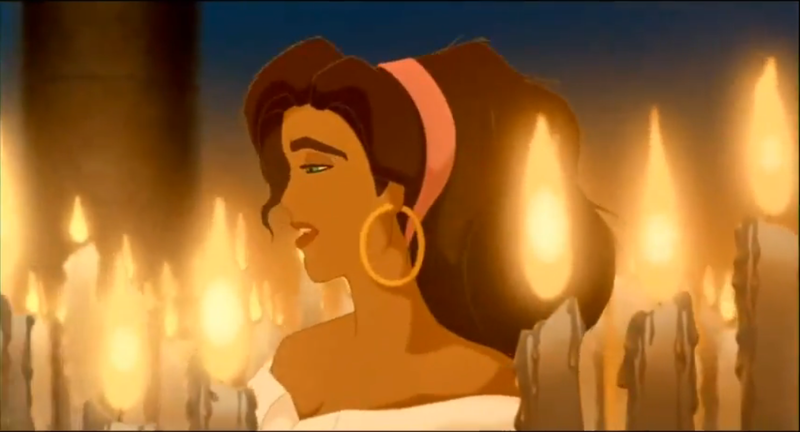 In the 1939 version, Esmeralda is sincere and humble, and as she not insulting anyone by saying she’s better off. In Ave Maria Paien (The Pagan Ave Maria) Esmeralda is (pending on which version your listening to) asking for a few things, protection from the fools who are in control and the joining of all people. The essence of the song is she wants Ave Maria on her side. Is it humble and selfless? Not really, she does come off as humble and sincere though. 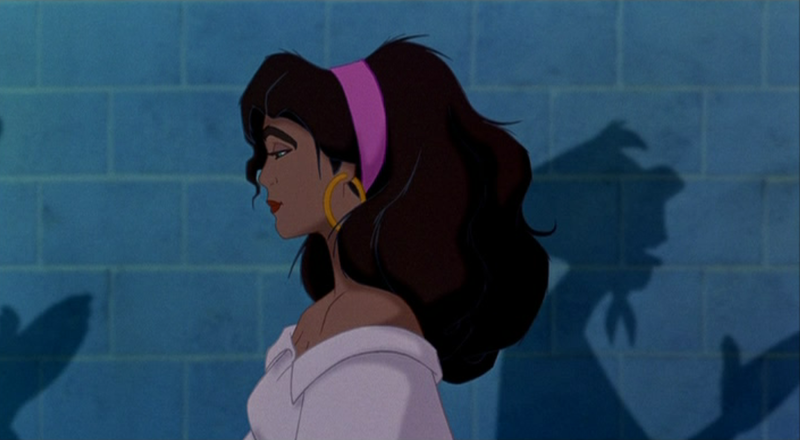 Disney Esmeralda is sincere but she seems to have a defeatist attitude, only god can help and no one else can, she’s powerless to do anything. 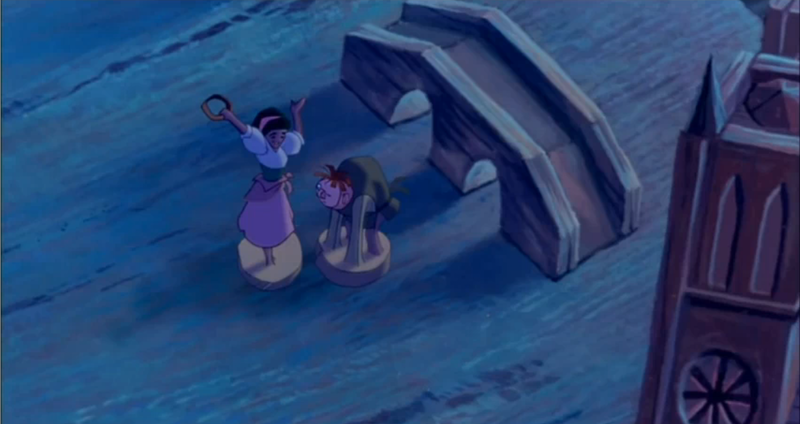 Maybe Esmeralda should have ask God to make Frollo tolerant. At least that would have been proactive. The problem with God Help the Outcasts isn’t the music or the singing, it’s the content. While it’s great that Esmeralda is mature and is capable of praying selflessly but in the course of the song she’s pretty much insulting her people, and due to juxtaposition of the her prayer with other parishioners she is making them look bad. So she can’t be selfless and humble without bring others down? I most respectfully disagree with most of your review. Esmerelda reveals how humble she truly is by saying she asks for nothing for herself. Saying she knows others less lucky than herself isn’t her saying she is better than others. Much to the contrary, she ignores how much she needs and focuses on her people who cannot “luckily” escape persecution as she is adept at doing. Additionally, Catholics pray to God through Mary. So by Esmerelda starting her prayer by addressing Mary and then stating her request of “God help the outcasts,” she is actually following a religious standard of prayer. Mary cannot grant requests, only God can do that. So she is asking Mary to pray to God for her. I strongly disagree with your statement that she is condescending. Additionally, her juxtaposition with the “faithful” in the church who are praying solely for their own needs clearly shows how truly spiritual the “pagan” gypsy is. This contributes to the main theme of the monster vs man, us vs them by showing that the outsider might be the one with the character traits those in the “right” assume are innate to insiders.